Bjorn, Clarke and McGinley (pictured in 2010). IRISH INTEREST IN the 2012 Ryder Cup has been increased after European Captain José María Olazábal named Darren Clarke and Paul McGinley, along with Thomas Björn, as vice captains for the September duel with America. The trio will form the spine of Olazábal’s backroom team, having successfully carried out similar roles at the Celtic Manor Resort, when Europe won by a point, two years ago. The Spaniard had the honour of being vice captain twice, in 2008 and 2010, and pointed out their invaluable assistance to winning captain Colin Montgomerie last time out. “All three are world class golfers with tremendous experience of playing in the Ryder Cup which is absolutely invaluable,” he declared. Olazábal added that it would be a pleasure to work with passionate and committed friends towards the goal of retaining the cup at Medinah, Illinois. It is important to have each match watched because you have to hand in your pairings for the afternoon matches when the players are still out on the course. Clarke, the 2011 British Open champ, believes he can ‘instil that relaxed atmosphere in the team room and help the captain get the best out of the players’. McGinley, who sunk the winning cup to clinch the 2002 Ryder Cup, said he was thrilled to be involved and added that he would like to keep his unbeaten cup run going against the USA. “The Americans always look to start fast especially on home soil, as they did at Valhalla in 2008, and we will need to be ready for that,” he cautioned. 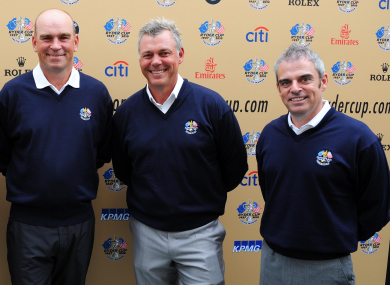 Email “Clarke, McGinley and Bjorn named as European Ryder Cup vice-captains”. Feedback on “Clarke, McGinley and Bjorn named as European Ryder Cup vice-captains”.